Suddenly, a flare went off on La Rubia's deck. Her stubby masts and spars became startlingly bright. Screams came across the waves, even above the growling of the surf and above the noise of the Esperance's engine. The flare shot through the air. It arched in a high parabola, bright in the sky, and fell into the sea. Another flare was ignited. The Esperance's searchlight flicked on. A long pencil of light reached across the waves as she raced on. More screamings were heard. Another flare burned. It arched overside. The Esperance plunged on, shouldering aside the heavier waves of open water. A half-mile. A quarter-mile. La Rubia wallowed crazily, and more shrieks came from her deck. Then the fishing boat seemed to swing. Beyond her, a conical, glistening and utterly horrifying monster emerged, a mere few yards from her rail. Enormous eyes glittered in the searchlight rays. A monstrous tentacle with a row of innumerable sucker-disks reached over the stern of La Rubia. Another flare swept from the fishing boat's deck in the direction of the giant squid. It fell upon wetted, shining flesh. The monster jerked, and La Rubia was shaken from stem to stern. Hurriedly, Terry pressed the power-feed button, and the sound projector was on. Its effect was instantaneous. The monster began to writhe convulsively. It was gigantic. It was twice, three times the size of the squid captured in the lagoon. Terry heard his own voice cry out, "Bazookas! Use 'em! Use 'em!" Flaring rocket missiles sped toward the giant. Davis flung one of the hand grenades he'd manufactured. The yacht plunged on toward the clutched, half-sunk fishing boat. The hand grenade exploded against the monster's flesh. Simultaneously, the bazooka-missiles hit their target and flung living, incandescent flame deep into the creature's body. Those flames would melt steel. They bored deeply into the squid, and they were infinitely more damaging than bullets. The creature leaped from the water, as chunks of its flesh exploded. It was a mountainous horror risen from the sea. As it leaped, it had squirted the inky substance which is the squid's ultimate weapon of defense. But, unlike small squid, this beast of the depths squirted phosphorescent ink. The beast splashed back into the sea, and the wave of its descent swept over the deck of La Rubia. The fishing boat nearly capsized. But the monster had not escaped the anguish of its wounds. It fought the injured spots as though an enemy still gnawed there. It was a struggling madness in the sea. Ein herrlicher Abenteuerroman. Nach einem langsamen Start steigert er sich kontinuierlich, bis es am Ende zum unabdingbarem Showdown kommt. 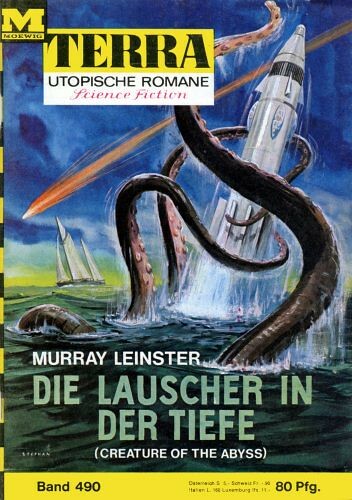 Aber - und das kann man dem obigem Auszug gut entnehmen - inhaltlich bleibt Leinster doch an der Oberfläche, das Buch ist nette eskapistische Lektüre, aber nicht mehr. Schade eigentlich, denn der Stoff hätte für eine intensivere Bearbeitung ausgereicht.